How has 13 weeks passed since the first Alabama football game???? I spend most of the summer anxiously waiting for football and I say the same thing every year. Once football season starts, it will FLY by. And its so true. After today, we will hopefully enjoy playoff and bowl season, but this is the final game of regular season. It has been an AMAZING year for the Tide and I can’t wait to see what happens. As far as rivalries go, this one is in the top 5 in the country. This is from the Huffington Post. When you’re talking about the biggest rivalry in college football, the Iron Bowl between Alabama and Auburn is always near the top of the list. Though the game has been played since 1893, there has only been one tie. In recent years, fans have made headlines for their over-the-top antics. An Alabaman Crimson Tide fan will soon face felony charges for allegedly poisoning a pair of oak trees on the Auburn campus. 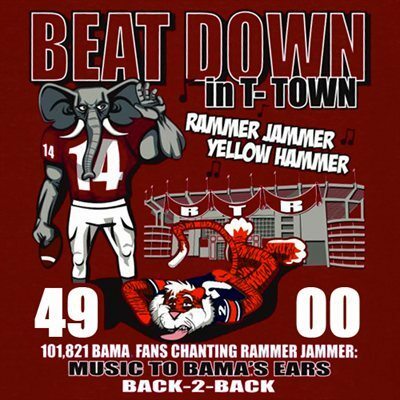 While I think that’s crossing the line, it’s hard to not be a fan of all the funny T-shirts this rivalry produces. If you think you can come up with something better, you can always make your own. The game on Thanksgiving weekend is serious business. If a team is having a bad year and can still beat their opponent, everyone considers that a winning season. For the loser of the game…it’s a year of suffering the taunts. We don’t like to lose. Edit: Game over and it was a doozy! We won by a lot and that includes putting in the second, third, and 4th strings in after the first 3 minutes of the 3rd quarter. I’m pretty sure that the coach for Auburn is going to get canned before the weekend is over. And that’s pretty sad considering Auburn won the National Championship in 2010. Next up: SEC Championship in Atlanta December 1st!